Can I ask the measurements of these bottles please. These bottles are approximately 14 x 2.8 x 2.4 cm. 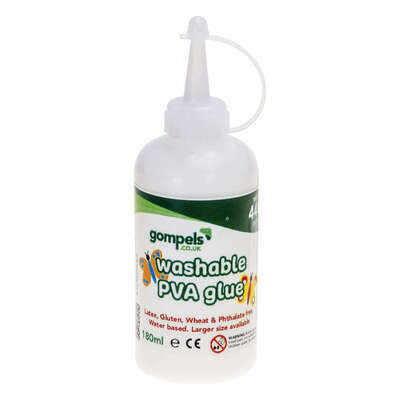 Great for a wide range of crafts and tasks, our Gompels Washable PVA Glue is available in a single bottle of 180ml. Suitable for use with young children making it ideal for nurseries and primary schools, this versatile glue is easy to remove from clothes, hair and skin while coming away from carpets and brushes reducing the risk of permanent damage. Providing a suitable adhesive for paper, card, glitter, and sequins, this ample bottle of PVA glue can be decanted into smaller pots and distributed around your pupils to control the level of waste. The non-toxic and solvent free formula promises safe use while the lack of phthalate, latex, wheat and gluten make it suitable for use with allergy sufferers. Our PVA Glue is also available in larger 5 litre bottles for larger or busier nurseries and at exceptional wholesale prices. Why not consider adding our Coloured Wooden Jumbo Lolli Sticks or Feathers to your basket as well to create the most engaging crafts session.